Internet users have a lot of questions and generalizations about the 50 states, and they often take those queries straight to Google. 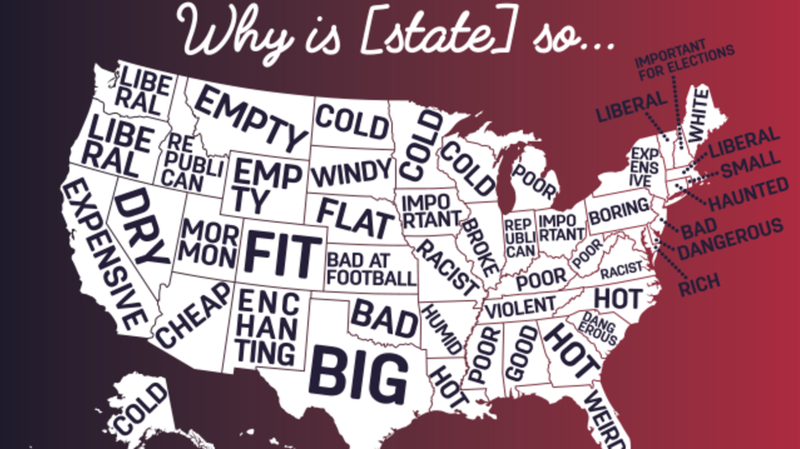 The searches help paint a picture of what people really think about each state. Just type in "why is [insert state here] so" and the site's autocomplete feature will show you which traits are most confounding to the average Googler. The results vary from person to person, depending on their location and other factors, but they are generally similar across the board. We took the top suggestions from our searches (in Chrome's Incognito mode) and put them on a map so you can get a full visualization. You can compare this map to one that made the rounds in 2014 and see how opinions have shifted.